Getting marketing budget approvals is tough, while expectations for growth keep increasing. According to December 2016 E-Marketer study, the biggest goals for digital marketers were to increase revenue, leads and traffic, while the biggest obstacle was to secure enough budget to achieve the goals. One of the reasons behind the difficulty to get budget approval is ROI. CEOs demand higher accountability and have expectations for proving the ROI of marketing budgets. In fact, 93% of CMOs say that they are under more pressure to deliver measurable ROI. This of course, trickles down to the SVP of Paid Media, then to the VP of Business Development, and finally to the Director of Marketing. Facebook ads are the most promising social advertising platform for E-Commerce with 1.86B users, an average ROI of 152%, an average conversion rate of 1.85%, and 85% of social media orders. Despite the promising stats, you still need to prove that Facebook Ads works for your E-Commerce business. Otherwise, getting approval for a substantial budget will be tough. So, the question is how do you maximize the ROI for Facebook Ads channel when you don’t have a big budget? When you have a limited Facebook Ads budget, focus on selling to your loyal customers first. You will maximize the customer lifetime value first, which will help you build a strong case for reinvestment in customer acquisition on Facebook. To do this effectively, your campaigns have to give your customers what they want, before they know what they want. I call them Customer-Centric Campaigns. Here is proof that customer-centric campaigns work. Our team at SCUBE used customer centricity to achieve 4,660% ROI on Facebook Ads for an E-Commerce education company. 4,660% ROI. Can’t beat that. Most importantly, Customer-Centric Campaigns helped us build a case for reinvestment of our Facebook Ads budget into new customer acquisition campaigns. Let’s explore Customer-Centric Campaigns in more detail. They involve two components: Customer Centricity and Facebook Custom Audiences. Your customers is why your company is in business in the first place. Businesses that better adapt to customer needs win. Deloitte and Touche research proves that customer-centric companies were 60% more profitable than other companies. In Teradata’s recent survey on data-driven marketing, 90 percent of marketers said that customer individualization is a priority, and that’s because they’re learning that the more personal the approach, the greater the chance of a positive response. This leads to the second component. Facebook Custom Audiences allow you to reach your customer segments (more on them later) and deliver a highly personalized message in a way that makes them feel like the advertising is relevant and helpful. Before we dive in, let’s clarify the conversation with a couple definitions. In this article, I am talking only about Custom Audience from Customer File. In reality, customer list is broader because it refers not only to customers, but to first-party contacts, which can be leads and newsletter subscribers. Every E-Commerce company has customer data. Data can tell a lot about your customer base. Best of all, you will start getting a deeper understanding of each segment and launch more personalized Facebook Ads for that audience versus casting a general message for everyone. Direct Marketing Association attributes 77% of ROI to segmented, targeted, and triggered campaigns. The email marketing industry has found huge value from segmentation for years. In fact, Lyris has reported that 24% of marketers who segmented their email lists experienced greater revenue, 24% increased sales leads, and 21% experienced greater customer retention. Here is how customer segments and Facebook Ads fit together. Analyze your customer database around common data points (more examples later) and create segments. On top of that you better understand the behavior and the ROI of each segment. After the segments are created, you have to upload them to Facebook. You can upload emails, phone numbers or Facebook UID from each segment. Facebook will match them against its user base and return you an audience ready to use for targeting advertising containing only the people in that list. Match rates vary, but expect about a 50% rate. For example, Wordstream got a 48.99% match rate on their customer list. 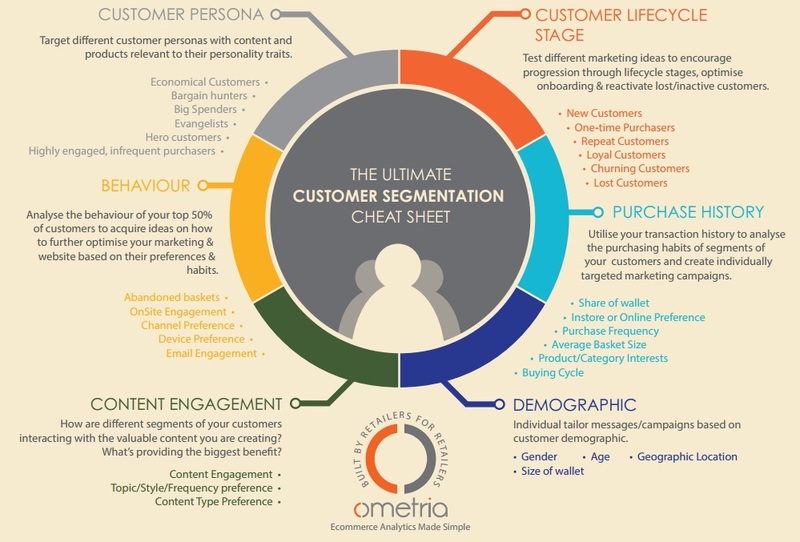 To create your customer segments, start with the following 4 data points. You probably have them, so make sure to use them. Understand how often your customers buy your products. Understand the seasonality of your products. Predict when your customers may need additional products. Purchase value data point is great because it helps you segment your customer base by value to your business. For example, “one of the primary ways marketers can increase sales with Custom Audiences is to re-engage with existing, high-value customers,” suggests Dan Morris, Director of Product Marketing at Marin Software. Once your segments are ready, you will start developing ways to engage each segment. What’s the point of using Facebook Ads to your newsletter subscribers, if I can send emails without paying the ad spend? Fair enough. Let’s look at the stats. The average email open rate in E-Commerce industry is 16.75%. That means on average 83.25% of your sent emails are not read. What's the value of a non-read email? To me it's 0. Case closed. If you have a strong email marketing team, you will likely have advanced segments available for your newsletter. Frequent respondents. “Find out exactly who opened your email, followed a CTA, clicked a link, and visited your website for further interaction. These are your ‘respondents’ as we call them”. At this point you have customer segments. The next step is customer research. Remember, to give your customers what they want before they know what they want it, you have to know what they want and communicate it in their words. Start with the Voice of Customer (VOC), which Gerry Katz of Applied Marketing Science Inc. defines as “the study of customer needs” through qualitative and quantitative research. VOC covers four areas: customer needs, a hierarchy, priorities, and segmentation. Your customer research will fuel your offers and messaging for each customer segment when developing Facebook Ads campaigns. So how do you find out what your customers want? I recommend 4 tools to start. Begin with what you have and only then perform additional research. Customer review sites like Feefo and TrustPilot resonate well with E-Commerce companies because they help to improve customer trust and sales. Reevoo reports an average 18% uplift in sales from customer reviews. Better click-through-rates. You expect to improve click-through-rates on paid search campaigns, resulting in more traffic at a lower cost per click. Customer research (what we care about right now). Find out what the customers care about in their own words. Group feedback into two groups: positive (5 and 4 stars) and negative (1 and 2 stars). Both will give you a perspective from both sides. Ignore the short feedback such as great, because it doesn’t give you any context. Dive deep into qualitative feedback and highlight the words customers mention (See the example below of how we did this for a client). Group customer feedback into recurring themes. You are likely using some sort of customer service software (Live Chat or Help Desk) to solve customer problems. It can be a goldmine of information for customer research. This is direct feedback at critical points within the relationship with your customer that can be used for customer research. Customer research is similar to using customer feedback on review sites. Begin with the two opposite sides of feedback: extremely positive and extremely negative. Dive deep into qualitative feedback and highlight the words customers mention. Survey Monkey, Typeform or Google Forms probably come to mind. Any other tool your E-Commerce business has used is fine. As long as you have data from your customer surveys. Then group everything into common themes. You may be using on-page surveys for conversion rate optimization. These tools offer non-intrusive surveys for your website’s visitors that will pop up at the bottom of the page, so you can collect customer feedback when they are taking action on your site. Dive deep into qualitative feedback. Highlight common frustrations and positive traits customers mention. Group them into larger themes. 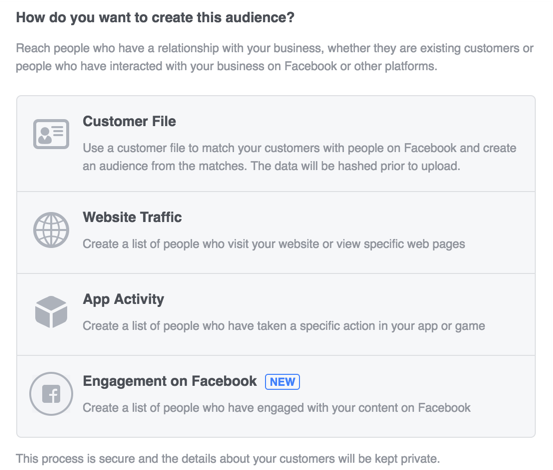 You segmented your customer base and have audiences ready in Facebook for each audience. You developed a better understanding of your customer segments by doing a customer research. 1. Context & Intent. The main data point that represents the segment, which will help to develop a hypothesis for intent. a) For example, a customer segment that purchased your product in the past 12 months and is eligible for an upgraded version. b) Another example, a segment of the top 20% of customers by the amount spent with your business. They have a higher affinity to purchase additional products and represent upsell and cross-sell opportunities. 3. Messaging. Incorporate the positive and address the negative feedback in your ads and landing page. Here is how other companies incorporated Customer-Centric Campaigns into Facebook Ads. 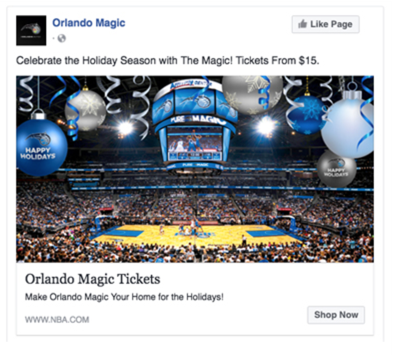 To encourage new game ticket sales, Orlando Magic used purchase date to create Custom Audiences for fans who had purchased tickets to previous games. This campaign resulted in 52 times ROI. The Museum of Science in Boston ran Facebook campaigns to promote their museum memberships. They segmented their newsletter list into a few categories such as subscribers to the Museum’s monthly email update, previous gift membership buyers, current and lapsed members. Their campaign resulted in 3 times ROI. The San Jose Sharks used the product type data point successfully to drive 33 times ROI for their Facebook Ads campaign. They created a previous season ticket customer segment, which was used to upsell SharkPak ticket packages (11 and 21 games). That’s it. Now you have a process to win with Facebook Ads and can prove to your leadership that this channel works for your E-Commerce business. Customer-Centric Campaigns will help you maximize the ROI with the existing budget. This is because you will maximize your customer lifetime value by giving your customers what they want before they know what they want it using segmentation, customer research and personalized messaging. The early success will give you momentum and a clear case to add more budget to the Facebook Ads channel. Share your success stories with Customer-Centric Campaigns in the comments below.